What's a dominant eleventh chord ? In theory eleventh chords are built with six notes. There can be major 11, minor 11 or dominant 11. 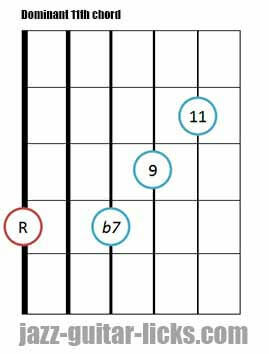 This article is focused only on dominant eleventh chords. 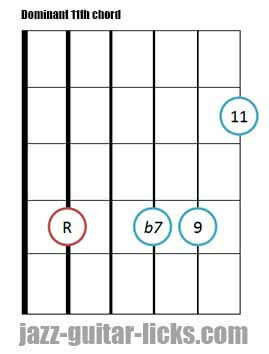 It is good to know that dominant seventh chords are built based on major triads with a minor seventh added (b7). In other words, the skeleton of a dominant chord is : root (1), major third (3), perfect fifth (5) and minor seventh (b7). That gives the structure of a dominant 7th chord. 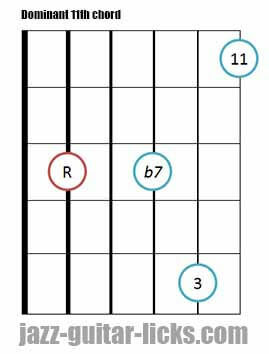 Adding the ninth (9) means that this chord becomes a dominant 9 chord. Now you just have to add the eleventh to get a dominant 11 chord. 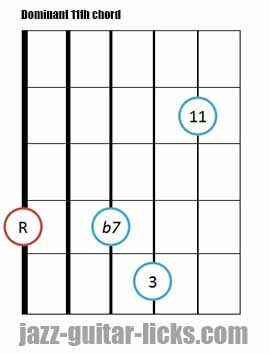 Dominant 11 chords can be confused with dominant 7sus4 and suspended 4 chords (sus4). There are some similarities indeed, these three chords contain a fourth (4) which can serve as an eleventh (11). Playing both the major third (3) and the fourth (4) doesn't sound pretty good (please note that the 11th is the same as the 4th). These two tones when they are played together create a dissonant and pretty unpleasant sound (however, it can be interested in certain situations). Consequently, the third is often omitted in the eleventh chord (see the diagrams 3, 4 and 5). This can create confusion because it changes the name of the chords. Dominant 11 becomes 9sus4. Still the chords are often written as an 11th chord. Here are two diagrams representing the dissonance produce by the 11th and the 3rd. You can notice that the 9th is omitted. Indeed, it is physically difficult if not impossible to play all the needed tones on the guitar. The two following dominant eleventh guitar shapes are less dissonant that the previous voicings. The third (3) has been omitted and replaced with the ninth (9). They are also easier to play.